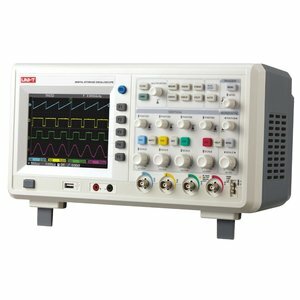 UNI-T UTD4204C Digital Oscilloscope is a desktop four-channel digital oscilloscope. 200 MHz bandwidth and 2 GSa/s real-time sample rate ensure detailed dispalying of high-frequency waveforms. UNI-T UTD4204C is characterized by a digital multimeter function. Convenient 5.7-inch color liquid-crystal display of the oscilloscope ensures bright and sharp waveform representation. 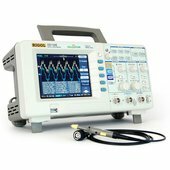 UNI-T UTD4204C Digital Oscilloscope is a good choice for production tests, R&D, design and all other applications involving testing and troubleshooting, as well as education and training. Vertical sensitivity: 2 mV/div – 5 V/div. Versatile trigger modes: Edge, Pulse, Video, Slope. Math functions: Add, Subtract, Multiply, Divide, FFT. Standard interface: USB Device, USB Host; Multimeter, LAN and GPIB.